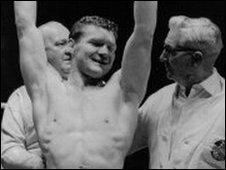 The funeral has taken place in Coventry of Mick Leahy, who won the British middleweight title in 1963 and at one time beat legend Sugar Ray Robinson. Mr Leahy died on 5 January, aged 74, at University Hospital in Coventry after a long battle with Alzheimer's disease. About 400 people arrived at 0930 GMT to Our Lady of Assumption in Tile Hill. Many mourners came from from Ireland, as Mr Leahy was born in Cork. He was forced to retire in 1965 after a car crash left him blind in one eye. After a long recovery, he worked for Massey Ferguson in Coventry.